Something happened today, but I decided not to felt it up yet because it would make catman sad. catman is an interweb friend who I sometimes play fun games with ...I hope that didn't sound perverted. Anyway.. 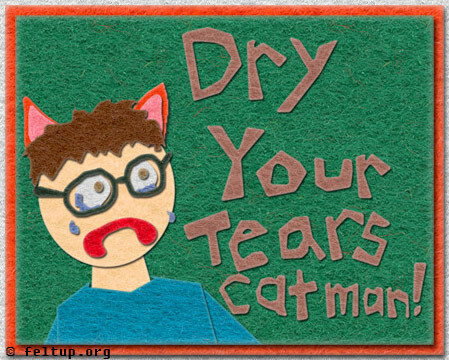 I have sort of not proceeded with my past pets because it makes catman so very sad to read about them. The next one will probably be very sad for him because it's a cat, but maybe not as sad as what happened today. You have a day to prepare yourself for the shock, or just don't read tomorrow. I'm going to bed now because I saw a stink bug flying around the apartment but was unable to catch it. Now I fear doing anything because the stinkbug could appear at any moment and ruin everything. It could certainly ruin sleep though.